Bill Baroni on Wednesday outside the federal courthouse in Newark after his sentencing to a two-year term. NEWARK — Two former allies of Gov. Chris Christie were sentenced to prison on Wednesday for their role in closing access lanes to the George Washington Bridge as political payback against a New Jersey mayor, a key chapter in the plot that derailed Mr. Christie’s presidential aspirations and then dimmed his chances to become President Trump’s pick for vice president. Bridget Anne Kelly, 44, who was a top aide to Mr. Christie, was sentenced to 18 months in prison, while Bill Baroni, 45, who served as deputy executive director at the Port Authority of New York and New Jersey, was sentenced to two years in prison. The scandal, which became known as Bridgegate, was as brazen as it was bizarre. In an effort to punish Mayor Mark J. Sokolich of Fort Lee, a Democrat, for not supporting Mr. Christie’s re-election bid and his desire to cultivate bipartisan support ahead of a presidential run, members of the governor’s administration schemed with Port Authority officials to trigger a massive traffic jam in Fort Lee. Over five days in September 2013, the gridlock ensnared emergency vehicles, school buses and commuters, even as Mr. Baroni ignored Mr. Sokolich’s messages seeking an explanation. 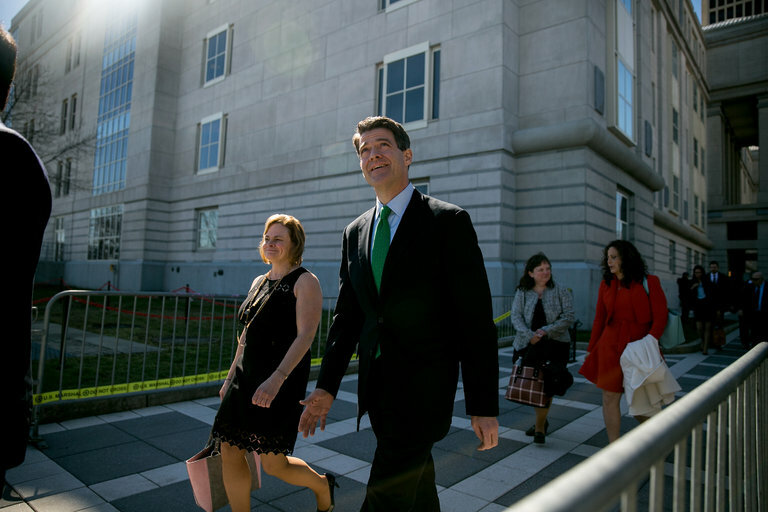 The seven-week trial last fall of Mr. Baroni and Ms. Kelly revealed Mr. Christie’s aggressive political operation, which seemed as focused on carving a path to the White House as it was on the needs of New Jersey. While Mr. Christie was never charged in the scandal, Judge Susan D. Wigenton alluded to the political culture his administration created on Wednesday as she handed down her sentences against Mr. Baroni and Ms. Kelly at the federal courthouse in Newark, calling it a toxic “with us or against us” mentality detrimental to New Jersey residents. “What occurred in September of 2013 was an outrageous display of abuse of power,” Judge Wigenton said. From the moment Ms. Kelly’s email became public, Mr. Christie’s then soaring political ambitions were dealt a blow from which he would never recover. From the daily news reports to the assembly hearings and investigations to the trial of Mr. Baroni and Ms. Kelly, the Bridgegate scandal became almost synonymous with Mr. Christie. As he sought the Republican presidential nomination himself, once a favorite and then a long-shot, the drumbeat of the scandal followed him from Iowa to New Hampshire. As he attached himself and his political career to Mr. Trump, it was again the scandal that deadened his aspirations, this time as a potential running mate; the governor himself allowed that Bridgegate was “a factor” in Mr. Trump overlooking him for the ticket. And while Mr. Trump never gave a specific reason, Mr. Christie’s role as transition chief for the newly elected Trump administration was terminated a week after the convictions for Mr. Baroni and Ms. Kelly were handed down. Before his sentencing, Mr. Baroni expressed remorse as he sought to avoid prison. During Ms. Kelly’s sentencing, her lawyer, Michael Critchley Sr., spoke at length, often emotionally, portraying Ms. Kelly as a selfless mother of four children whose family had been devastated by the scrutiny Ms. Kelly has been under since the scandal erupted. Then Ms. Kelly, her voice shaking, dabbed her eyes as she rose to deliver a passionate plea for mercy and to apologize to her family. Both Mr. Baroni and Ms. Kelly vowed to appeal their sentencing. Federal prosecutors, in arguing for jail sentences, said that Ms. Kelly and Mr. Baroni, who was Mr. Christie’s top staff appointment at the Port Authority, had abused their positions for personal gain and had failed the people they were supposed to serve. Mr. Baroni, prosecutors said, also perjured himself during his trial, maintaining that the lane closings were part of a traffic study, when in fact it was motivated by politics. Prosecutors argued that while Ms. Kelly may not have been as bold or duplicitous as Mr. Baroni, they painted her as the person responsible for orchestrating the plot. The investigation into the lane coverings uncovered wrongdoing by another person who was part of Mr. Christie’s inner circle — David Samson, a former New Jersey attorney general and a longtime friend of the governor. He was charged separately and pleaded guilty to bribery for personal gain after an investigation showed that he had pressured United Airlines to resume a flight to South Carolina near where he has a home. Mr. Samson was sentenced this month to a year of home confinement. The lane closings proved to be one of the biggest scandals in New Jersey history, a state that is familiar with official malfeasance. For his part Mr. Christie was nowhere near the courtroom, nor even in New Jersey, on Wednesday. The governor went to Washington to meet with Mr. Trump for a round-table discussion on opioid addiction. Mr. Christie made several appearances on morning television to promote the effort, but demurred on commenting on what would transpire in court.